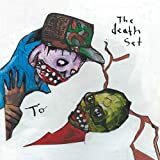 The Death Set (also typeset as TheDeathSet or The DeathSet) is an experimental music band with roots in punk rock, sometimes referred to as art punk. The band formed in 2005 in Sydney, Australia. Six months after its inception, the band moved to the East Coast of the United States, living in Baltimore, Philadelphia and Brooklyn respectively, where the band found an audience for its style of experimental, cross genre, punk rock. Moving after less than two years in each city the band has been nomadic, yet thrived in each base. All members now currently live in Brooklyn, New York. The band fuses punk rock sound and energy, electronic music production and hip hop sampling into their recordings. Their live shows are high energy events, inciting crowd chaos and sometimes played at crowd level with the audience surrounding the band. The band was originally formed with Johnny Siera and Beau Velasco sharing vocal, guitar and production duties. The current lineup features Siera in the same role, Daniel Walker on guitar, vocals and production and William Brousaard on drums.